God’s Pocket Marine Provincial Park provides some of the best underwater scuba diving on the Pacific Coast. Most diving takes place in nearby Browning Pass, an area rated by the late underwater explorer Jacques Cousteau as one of the best cold water diving destinations in the world. Conditions can be difficult however, so all divers should be experienced and well-equipped. This undeveloped park is comprised of a group of islands at the entrance to Queen Charlotte Strait, including Hurst, Bell, Boyle, Crane Islands, and numerous smaller islets. These islands provide sheltered anchorage for boats heading north or south in Queen Charlotte Strait. In addition to diving, the park offers opportunities for fishing, boating and wildlife viewing. Bald eagles and whales are common sights in the park, which protects a seabird breeding colony and Bald eagle habitat. Boaters should be aware of winter storms and use caution in the area, as weather and sea conditions can change rapidly in this park. This park has no facilities or designated campsites. When choosing a camping location, please take into consideration potential hazards such as tree/limb failure, winds, and tides/high water. Bring your own drinking water as potable water is not available in the park. All surface water should be boiled, treated and filtered prior to consumption. Please use portable stoves for cooking. There are no campfire pits in the park. If you require a fire for emergency reasons, please keep it as small as possible and limit it to established fire sites or to spots situated below the high tide mark. use only small, downed wood that will burn completely. There are no developed trails or designated swimming areas in the park. The nearest boat launch is located in Port Hardy. God’s Pocket Marine Provincial Park is located on the north side of Goletas Channel approximately 10 km northwest of Port Hardy on northern Vancouver Island. 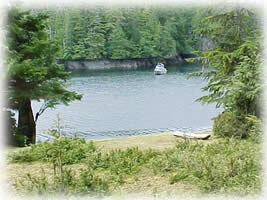 The park can be accessed by boat or float plane (to a lodge nearby) from Port Hardy. Boaters can reference marine chart #3549 (Queen Charlotte Strait western section) for more information on this area. Cultural Heritage - God’s Pocket Marine Park was inhabited by First Nations of the Kwakwaka’wakw speaking people and later by European settlers. A number of known archaeological sites can be found in the area. God’s Pocket Provincial Marine Park was identified for protection in the Vancouver Island Land-Use Plan. Conservation - God’s Pocket Marine Park protects a seabird breeding colony and Bald eagle habitat and contributes to representation of the area's marine and terrestrial landscapes. Wildlife - Marine mammals such as Orcas (killer whales), Pacific White-sided dolphins, and harbour seals are commonly seen in this park. On a more infrequent basis, Humpback and Gray whales can be spotted, as well as Stellar sea lions. Park visitors may see Bald eagles, auklets, black oyster catchers, cormorants, petrels and a number of other bird species in God’s Pocket. Sea kayaking is a very popular recreational pastime in God’s Pocket Marine Park. Please ensure that you are well prepared, since the weather and the sea state can change rapidly. Reference marine chart #3549 (Queen Charlotte Strait western section) for more information on this area. Good fishing for salmon, halibut and rock fish can be had in this park. Fishing is permitted as per provincial and federal fishing regulations. All anglers should check the current regulations issued by Fisheries and Oceans Canada prior to fishing. Anyone fishing or angling in British Columbia must have an appropriate licence. Backcountry areas are not suitable for dogs or other pets due to wildlife issues and the potential for problems with bears. Pets/domestic animals must be on a leash at all times and are not allowed in beach areas or park buildings. You are responsible for their behaviour and must dispose of their excrement. This area is considered one for the best in the world for scuba diving. Nearby Browning Passage was rated as second best cold water diving area in the world, and is consistently rated as one of the top diving destinations. God’s Pocket Resort offers dive excursions in the area. God’s Pocket Resort, a private lodge, is situated in the western portion of the park on Hurst Island, near Christie Passage. This resort specializes in diving, kayaking and wildlife viewing tours. There are no designated campsites at this park, however random wilderness camping is allowed. No fee is charged and no facilities are provided. Please practice “Leave No Trace” camping ethics. This park is open year-round. There is no fee for winter camping. Please practice “Leave No Trace” camping ethics. This park is open year-round. There is no fee for winter camping.